Some of the themes in my writing include finding balance in life living as an A-type personality, and sharing ideas to make juggling it all just a little bit easier. While I always hope I can inspire others with my writing, I’ve decided I want to try something a little different and take the opportunity to share those who inspire me in some way. Today I am excited to be kicking off a new Inspiring Women Series on the blog. In this series I will be sharing the stories of women across Canada, who are just like you and I. Women who struggle to keep it all together as they work or volunteer, raise a family and overcome life’s everyday challenges – yet demonstrate strength, generosity and optimism. I will be showcasing some of the work these remarkable women do in their communities and the impact they have on improving the lives of others. Here’s to strong women. May we know them, may we raise them, may we be them. 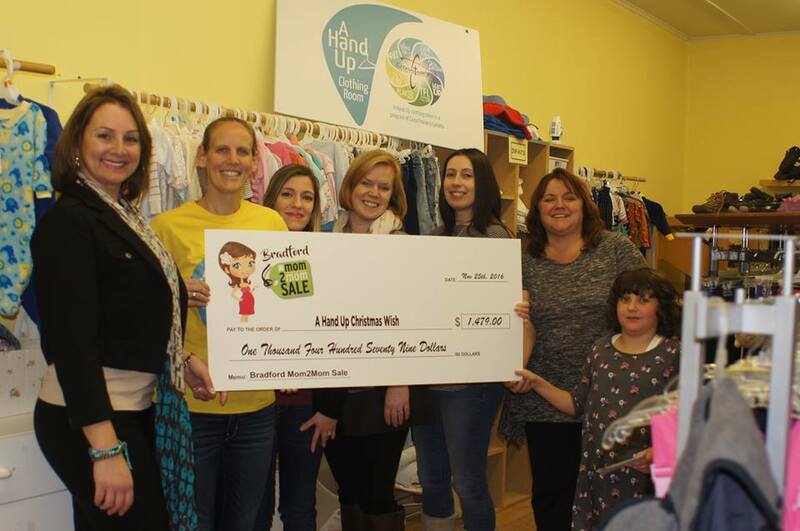 So first up, I would like to introduce not one, but 5 inspiring women who work as a team to put on an incredible event in Bradford Ontario called the Mom 2 Mom sale. Genna is a mom of two-year-old twins and is pregnant with her third. 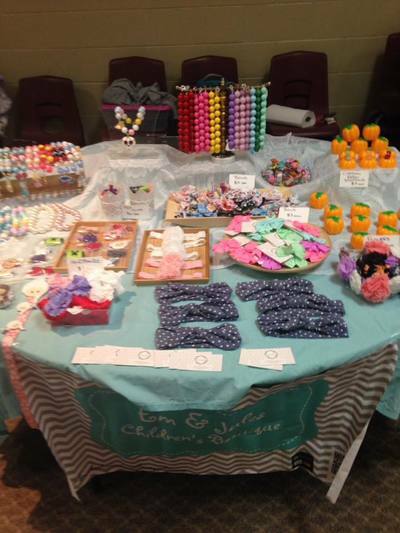 She is a stay at home mom and entrepreneur who creates customized children’s accessories. She worked in children’s mental health for almost 12 years and volunteers her time to manage an online community and organizes social events to connect local moms. Anna has 2 kids, a 6.5-year-old boy (we all know how important the .5 is) and a girl who is almost 4. Anna lives the commuter life and takes a train to the city of Toronto to work a full-time job in the healthcare industry. She also runs a business on the side that sells Origami Owl custom jewelry and sits on the parent council at her kid’s school. Angela has a 2.5-year-old girl and is on maternity leave with her newest addition, a 5-month-old boy. She plans to return to work eventually to her job at a local bank. 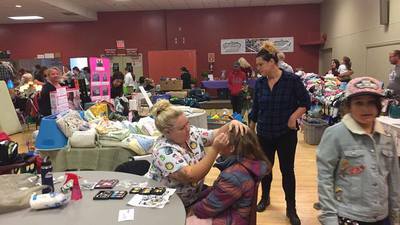 Angela loves to take part in various community events and dedicates her spare time to supporting various social events for moms as well as the Mom 2 Mom sale. Patricia has a 4 and 7-year-old and is another entrepreneur in the group with a passion for organizing special events. Her business supports families in event planning including banners, loot bags and creating fun & exciting candy & sweets tables. She also works as a legal assistant and enjoys volunteering her time at local events and helping those in need. Christine has two kids, aged 4 and 7. She works full-time as a dental hygienist and manages her oldest son’s hockey team. She also volunteers on the parent council at her son’s school and spends her spare time cooking, cleaning and having fun with her kids. Patricia – We were all strangers at one point but most of us met through social events posted on a local mom group on Facebook. Some of us met through volunteering for our kids’ school parent council. Eventually, we all landed on the Mom 2 Mom sale organizing committee. There was a time when meeting other moms was hard. I remember being a first-time mom in a new city and I felt lonely. The only moms I met came from getting dressed, leaving the house and just praying a conversation would ignite with someone at a local playgroup or parenting workshop. It’s amazing that through Facebook and other social media platforms, women are getting connected online before going out to meet up at organized social events. So you guys are now all connected through the Mom 2 Mom sale organizing committee, what exactly is the Mom 2 Mom sale? Angela – The Mom 2 Mom Sale is an event where moms can rent a table to sell their gently used baby and children’s items to other moms. The table rental fees, as well as admission and raffle ticket funds, are always donated to a local charity. We try to get local businesses involved in any way possible, both as vendors and sponsors. The raffle prizes and swag bag give aways are a big draw and in general, it is a great family event as we have lots of fun things for kids to take part in. Can you share some of what the kids do at the event? Anna – This year we encourage kids to wear a costume because there is trick or treating and a free photo for kids in costumes. There will also be face painting, a balloon twister, a coloring contest, mascots & superheroes, a toddler play zone and mini cupcakes. All of this is free courtesy of our wonderful sponsors. It’s nice that this kind of event is not only a garage sale which the parents would enjoy but a true destination for families… something to do with the kids over the weekend. It’s also pretty neat that since Halloween is so close to the event date, you could tie in costumes and trick or treating. How did the Mom 2 Mom sale come to be and how long has it been running? Anna – The event has officially been running since 2011, however, I joined on board as of April 2015 when the Chair moved out west. The Mom 2 Mom originally started as a group of moms who envisioned this event to be a massive garage sale in a community growing with young families. What was the original motivation in putting the mom to mom sale together? Anna – I think the biggest motivation was (and always is) to donate funds to amazing charities and causes in our own backyard. When you have a goal that truly inspires you to dedicate the time to, it is all worth it at the end when you see all your hard work come together and benefit not only the moms selling their items and businesses but also to the benefactors from the event. Where exactly do the funds to donate to charities come from and how does this sale benefit other moms and the people of your community? Angela – The sale benefits other moms and our community in many ways. 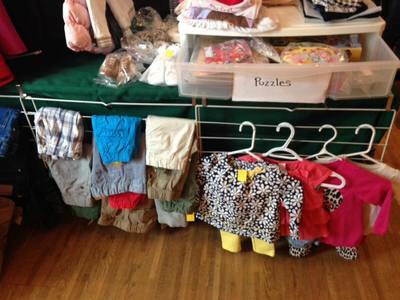 Moms have an opportunity to sell their no longer needed items. Not only do these moms make money for themselves but give back to the community knowing that the table rental fees go to local charities. We charge a $2.00 admission that goes to the local charity OR families can waive the admission by bringing in a donation for our local food bank. Moms that come to shop are able to find great deals on baby and children’s items. We also provide a fun place for people to visit and support others in our community. I love this… it’s amazing how this event brings together mom sellers, mom buyers, charities, the food bank AND local businesses… the concept is brilliant! Do the charities that benefit from this event change year to year? What charities are benefiting this year? Anna – Yes, each year the committee will decide on where the proceeds will go. It is always in our town of Bradford. In past years proceeds have gone to: A Hand Up Christmas Wish, Helping Hand Food Bank, and BWG Community Meals. This year it will go to a 2-year-old girl named Brooklyn who lives in Bradford and has some expensive medical needs. At the end of the event, any items the Mom vendors wish to donate will be picked up by A Hand Up Clothing Room. I can’t get over how well thought out this event is! 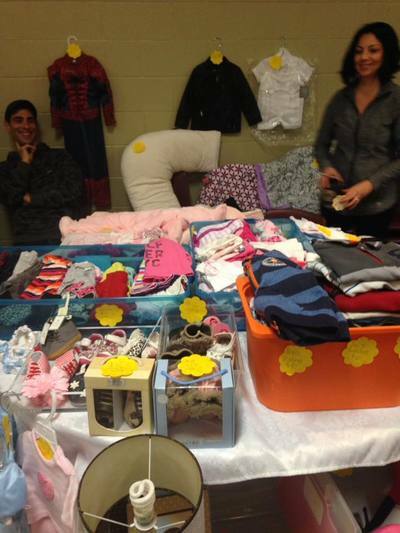 It’s so easy for the mom vendors to donate whatever they don’t sell at the end of the event… I love it! Maybe I’ll have to come next year as a vendor. So how did you manage to grow the community partnership and bring it to the level it is today? Anna – Over the years the committee has worked very hard to connect with our local businesses for sponsorship. It is because of these sponsors that we are able to make this event fun for all who attend. We have swag bags for the first hundred attendees, raffle prizes and fun activities for the kids. I think since our event is supported by the community and the town, it really helps us grow and make it bigger and better. Without the local business support, we cannot do this so it’s amazing to have the backing from businesses, the town, and our neighbours. What roles do you each have in making this all come together? 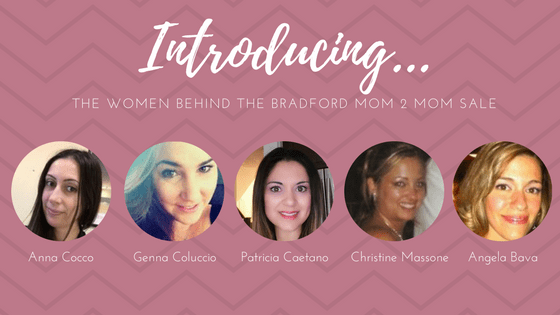 Genna – We all work really hard to ensure the event will be successful by seeking donations, sponsorship, and organization raffled items, endless phone calls with local businesses and with one another to ensure we are successful for another Bradford Mom 2 Mom sale. Christine – Each of us has a role. I take care of the media, and we each help to gather sponsorship’s, raffle items etc. We have endless phone calls, texts and group chat messages to ensure we all know exactly what’s going on, what needs to be done. Anna – We each are responsible for certain roles but we all work together and many things take the involvement of the entire committee. However, by assigning certain tasks it makes it easy for us to do what we need and report back to the group. Angela – We all work together to ensure we can raise as much funds as possible. We are all assigned certain tasks but help each other successfully execute them. All of us reach out for sponsorship, some of us do social media, some are in charge of recruiting volunteers, and some are responsible for being in touch with our local council members and newspapers. Patricia – We work together. As we are each assigned certain tasks, one role that I am assisting with is reaching out to our community for volunteers to assist in the Bradford Mom 2 Mom event. What is the biggest challenge you face when working to pull this off? Genna – I would have to say it’s finding the time to do everything. Juggling a family, working, and trying to put aside time to get everything done has been difficult, however you manage because you know it’s for a fantastic cause, and your heart is in the right place. Christine – The biggest challenge is finding time. All of us have families that have to come first. We all have children who need our full attention. Anna – The biggest challenge is always time and finding people to come help us! Angela – The biggest challenge is making sure we get everything done in a timely manner. Often it’s a matter of finding time within our personal schedules to make it all work. Patricia – I think that the biggest challenge is having all assigned tasks completed prior to the event by finding the time to complete them. I would also say finding volunteers for the event can be challenging. How do you balance this volunteer work with the rest of your lives as a busy mom? Genna – It’s not easy, but as our hearts are in the right place, you just find time. You set aside a few hours of your day to devote to contacting, communicating, and planning. Every single one of us is busy, just like any other mother out there. This is something we want to do, we want to give back, and so we just make the time! Christine – We balance our time by being organized. Anna keeps us all on track with her many different charts what needs to be done. It’s hard at times but when you put your head down on the pillow at night it’s a great feeling knowing that we are helping out different charities and actually making a difference. Anna– Balance is KEY. I think being super organized and using your calendar helps tremendously. Doing something like this is good karma and just knowing that it is for a great cause makes you find the time to do what you need to do. We usually start planning over a year in advance so we have the time and it isn’t rushed into a period of 2-3 months, for example. Patricia – I try to do what I can throughout the day during the weekday. So for those who live in the Bradford area, what do you want them to know about the Mom 2 Mom sale? Genna – Come on out to our event! Bring the kids, bring the entire family! There’s something here for everyone! All proceeds are going to Brooklyn, let’s come together as a community and show her and her family some Bradford love! Anna – For those who attend each year, thank you! Your support is appreciated! And for those who haven’t – come out! Its a family friendly event with lots going on this year – face painting, superheroes, cupcakes, raffle prizes, swag bags, trick or treating, photos….plus amazing deals on toys, books, and clothes save some money on the kids! And this is all for an amazing little girl in our community to help her rehabilitation needs. Angela – The mom 2 mom sale is an event that everyone should come to and support. All funds raised always go right back into our community. We also accept non-perishable food donations that are given to The Helping Hand Food Bank right here in town. There are lots to see and do as well as freebies for our attendees. Patricia – The Mom 2 Mom sale is a great event. Lots to do there for children. For the moms who might like to start something like this in their community – Where do they start in organizing this? Anna – I would like to say JOIN US if you are in Bradford! We are always looking for moms interested in supporting their community and getting to know other families and pulling off a great event. Otherwise, do research – it takes time, planning and work to start. You need to assemble a team who is dedicated to volunteer their time. It is the first thing you MUST have…once you have that, then you need to organize what you want your event to be – what is the goal? Why are you doing this? You need the Why, What, When, How figured out and then you can build more off of those plans. That is great advice…thank you ladies, for taking the time to share the concept of your community event and how you manage to make it all happen to benefit your community. It is amazing to see how as a team you come together to make this happen…even with twins or a hockey team to manage! You each have your own role and important part in this and I can see so clearly how this is meaningful to each of you… that as Christine put it, you lay your head down on the pillow at night feeling good. You guys are truly inspiring! I wish you the best of luck at this year’s event and hope that you raise the funds you need to help Brooklyn and the many other charities you support. For my readers in Bradford, here are the details…I will be seeing you there!